Goodreads Synopsis: Ever since the night of the incident with Luke Willis, the preacher’s son, sophomore Hallelujah Calhoun has been silent. When the rumors swirled around school, she was silent. When her parents grounded her, she was silent. When her friends abandoned her … silent. On a group hike, the incessant bullying pushes Hallie to her limit. When Hallie, Rachel, and Hallie’s former friend Jonah get separated from the rest of the group, the situation quickly turns dire. Stranded in the wilderness, the three have no choice but to band together.With past betrayals and harrowing obstacles in their way, Hallie fears they’ll never reach safety. Could speaking up about the night that changed everything close the distance between being lost and found? Or has she traveled too far to come back? I'll have to admit that I was going into the book with low expectations: I haven't heard the book around, the premise sounded okay, and I wasn't to sure about characters, especially when you have a protagonist with the name Hallelujah. But after reading it, I would it to be such a good read, it was a good heartfelt book, with golden moments that brought the book together. The Distance Between Lost and Found centers around quiet, shy girl Hallelujah Calhoun (or Hal/Hallie), who has her life changed over rumors of the night she spend with the preacher's son, Luke Willis. As she decides to go on a youth retreat into the woods and gets lost, she comes face to face with her emotions, but also friendship and romance. At first, the beginning chapters of the book were okay, nothing special, it was just a bunch of layout chapters. Later on when Hallie goes into the woods with Rachel and Jonah, two other teens from the youth group,is when things kick up and begin. I found Hallie to be a good characters, she had many layers to herself the more you read the book. She starts out as this quiet girl, but as the novel progresses she finds herself and even befriends Rachel and Jonah, two friends she never thought she would have until the night with Luke. And with all that going on, Holmes weaves in survival aspects into the story. One thing I enjoyed when reading the book was the blending of a survival story with a protagonist finding herself. Holmes did a great job developing Hallie, but also Rachel, as a fun and spunky girl and Noah, a boy who opens up for the first time. Any reader could easily delve into this story because it is such an easy book to get wrapped up in. Alongside, readers also experience an emotional connection with all of the characters as they try to survive in the forest. 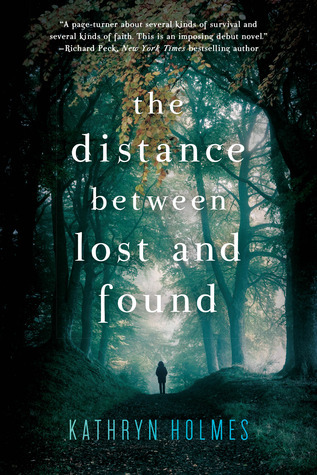 Ultimately, The Distance Between Lost and Found was a heartfelt book, that everyone needs to add to their TBR pile! It is definitely a great summer read and Holmes's simplistic writing will have you wanting to pick up the book over again! I bought this book a while ago. Like you, I've not read too many reviews of it. I'm even more intrigued now that I've read your review. Thanks for sharing, Patrick!